Marion Woodman is a Canadian “living treasure,” a Jungian analyst and writer from Toronto whose books such as Addiction to Perfection and Leaving My Father’s House have been deeply helpful to many women—and men. This new book consists of candid and wide-ranging interviews, dating from 1985 through 1992, which illuminate Marion’s unique perspective on the feminine, touching on sexuality, creativity, relationships, addictions, healing rituals and the environment. 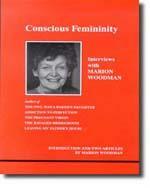 Those already familiar with Marion Woodman through her writing, lectures or workshops will value the deep passion that animates these discussions of her work. For those who haven’t yet discovered Woodman, this is a good place to start. I remember when that realization struck me. It was as if Niagara Falls had broken open my heart, and I was a frail atom in the universe with some incredible energy pounding through me. That night I dreamed of a tidal wave relentlessly pushing its way. On its crest was an immense chocolate-colored woman, her magnificent arm upraised like Delacroix’s Liberty. She was moving in and nothing could stop her. Then I was a molecule in the wave, in harmony with countless other molecules. We were all empowered with the love that would bring her to land.